Hello! Today I'm back with another Born Pretty Store review. If you missed my last Born Pretty post, you can find that here. 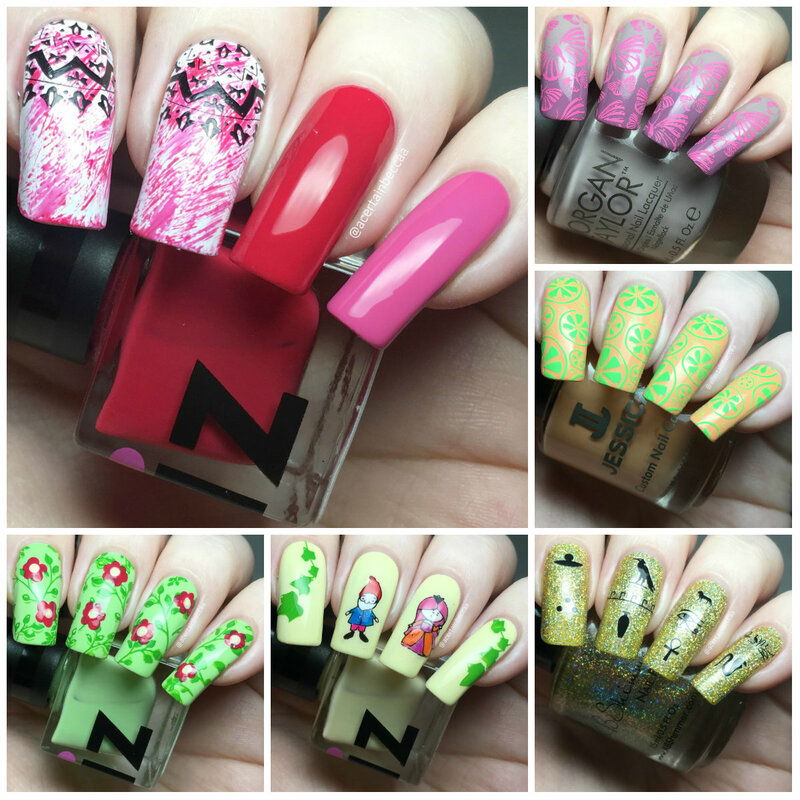 This time around I have five stamping plates to show you, as well as a packet of nail stickers. With a total of six manis to share, I'll just get into it! Read on for more info. The first three plates I chose are all the smaller, square ones. I picked mandala plate S004 (item #42524, online here), butterfly plate BP-X52 (item #41068, online here), and fruity plate BP-X45 (item #40485, online here). For the mandala plate, I stamped in black over some dry brushing. 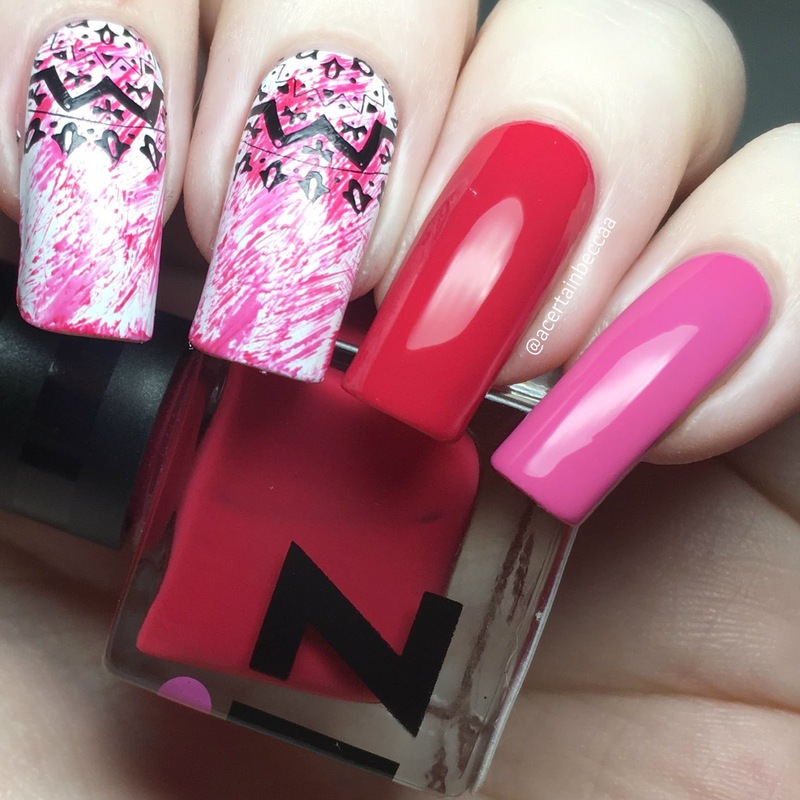 I dry brushed both iZ Beauty 'Swing Fling' and 'Pom-A-Rita' over a white base, and painted my ring and pinky nails in the same two colours. For the butterfly plate, I started with a grey to purple gradient using Morgan Taylor 'Rule the Runway' and Butter London 'Fancy'. 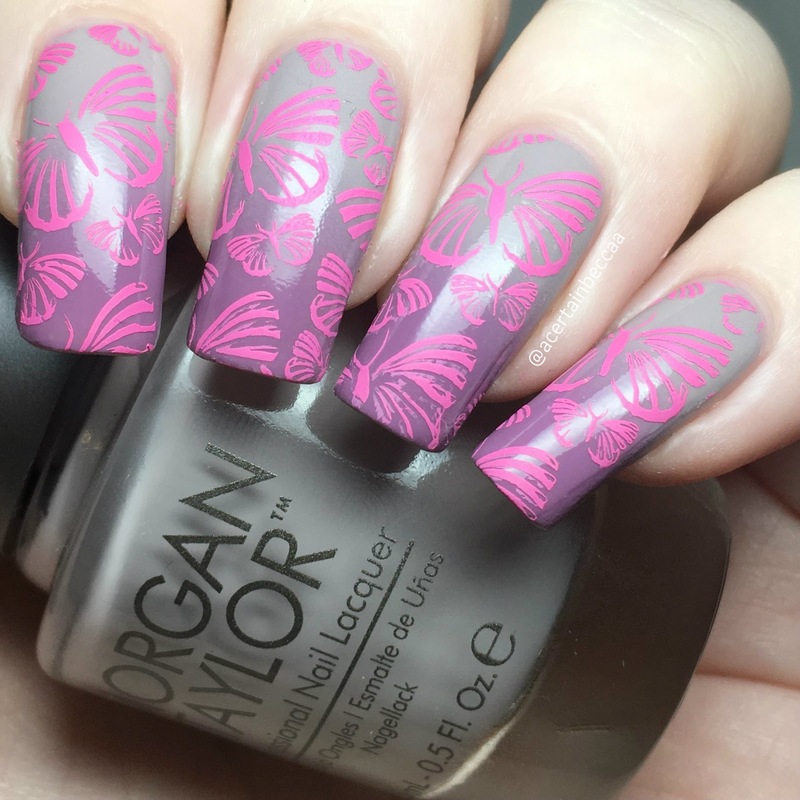 I then stamped my chosen butterfly image using Esmaltes Da Kelly 'Kiki'. For the fruit plate, I stamped the top left sliced fruit pattern in bright green using Esmaltes Da Kelly 'Bruce'. My base colour is Jessica Cosmetics 'Boho Babes'. The remaining two plates are both the larger rectangular plates. I picked spring garden plate L001 (item #42516, online here), and fairytale plate BP-L105 (item #41097, online here). 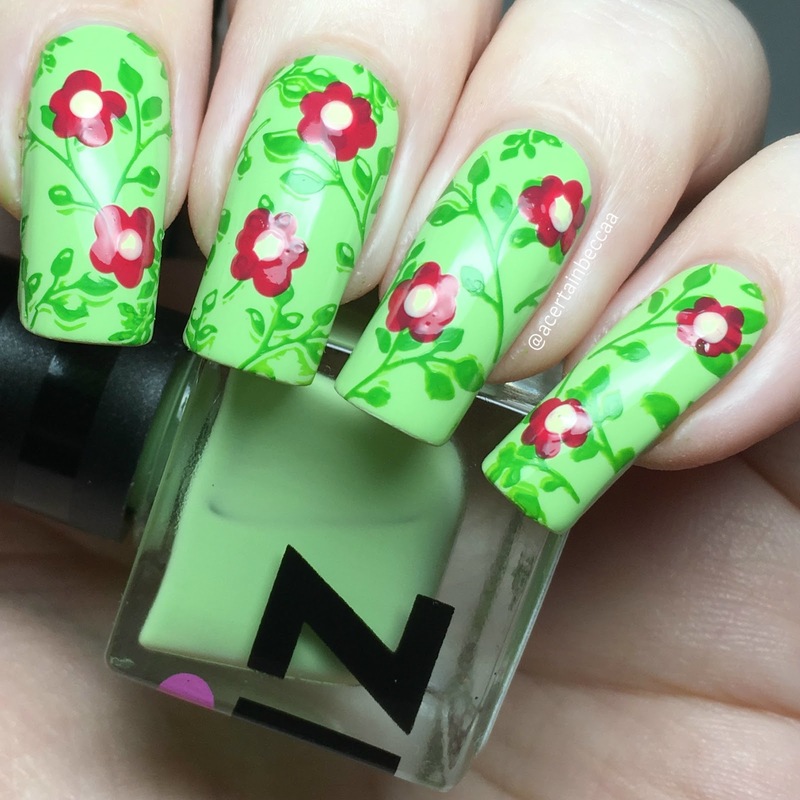 For the spring garden plate, I started off by stamping the top right leaf pattern over a base of iZ Beauty of London 'Lime Isle Sour', using a green Born Pretty stamping polish. I then used a dotting tool and iZ Beauty 'Pom-A-Rita' and 'Lemon Meringue' to add some flowers. 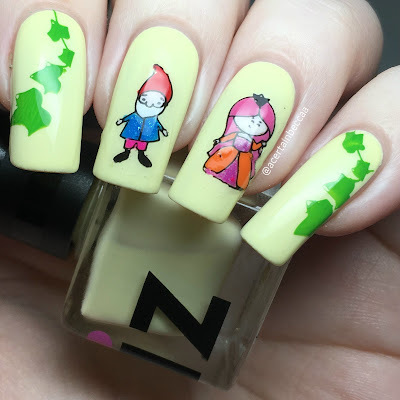 For the fairytale plate, I stamped the ivy on my outer nails, and made decals of the princess and a gnome for my middle and ring nails. This mani didn't entirely go to plan. Not only is my princess wonky, but did make a decal of the castle (but coloured it orange and red, so it ended up more spooky castle than fairy castle). I still did like the final outcome though. My base is iZ Beauty of London 'Lemon Meringue'. 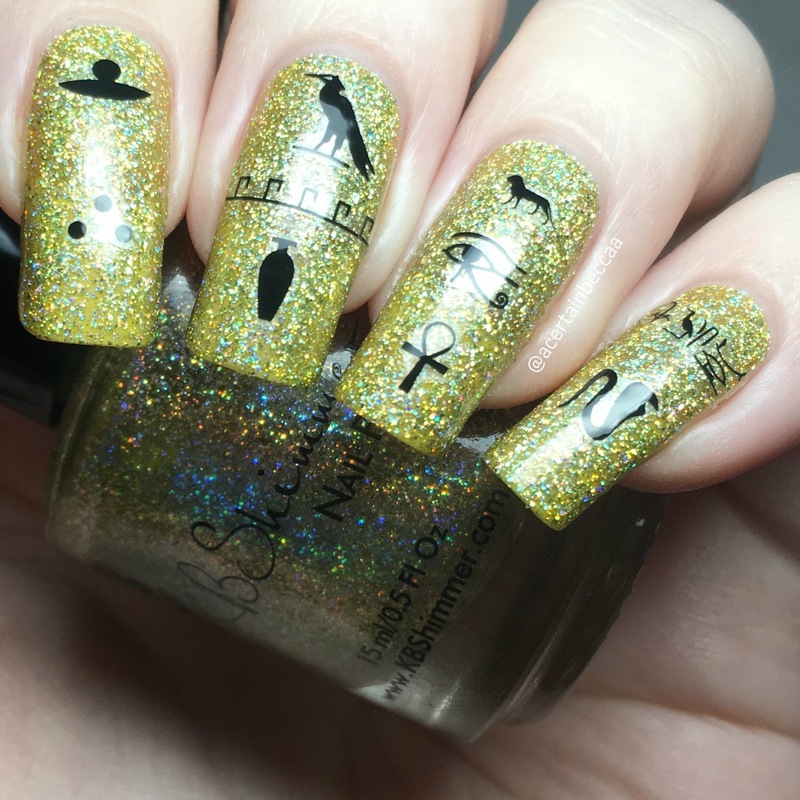 Last up, I chose a packet of Egyptian themed nail stickers (item #41735, online here). These were super easy to use. 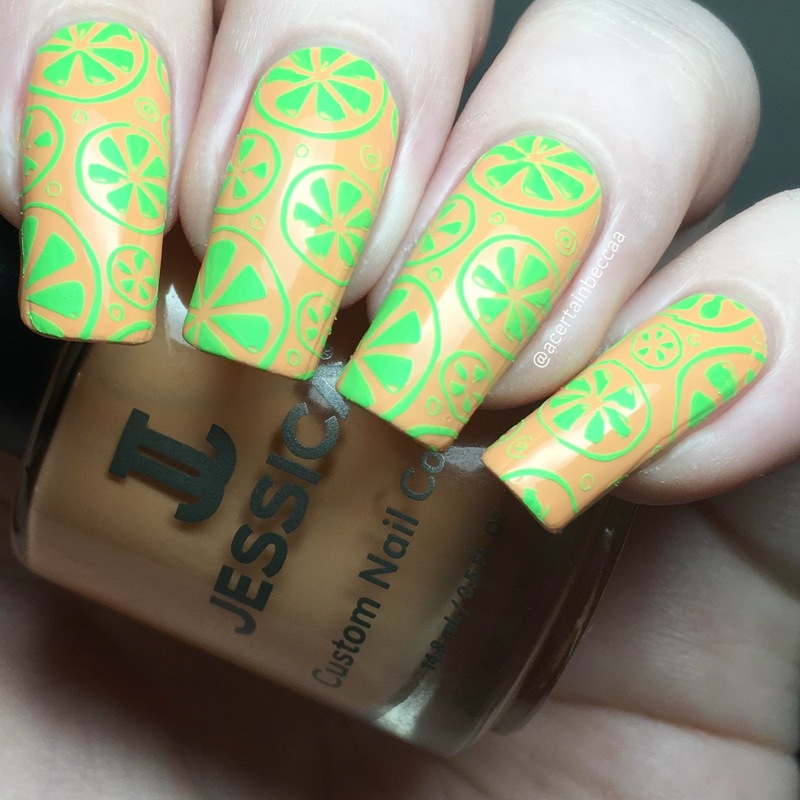 I simply peeled them off and stuck them onto a base of KBShimmer 'Stalk Market'. They also topcoated well, as opposed to other stickers that can smear, curl, or dissolve. What do you think? As always, I found all of the items I was sent super easy to use and had no issues with any of them! I have so many Born Pretty items now that it may be getting slightly out of hand, but they're so good - and such good value for money!